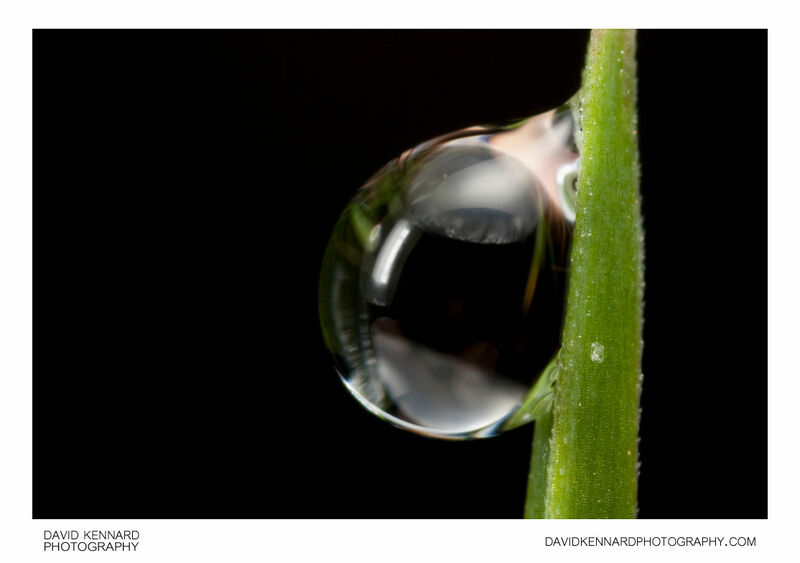 A drop of water hangs from a blade grass. The cohesive forces among the liquid molecules are responsible for this phenomenon of surface tension. In the bulk of the liquid, each molecule is pulled equally in every direction by neighboring liquid molecules, resulting in a net force of zero.The molecules at the surface do not have other like molecules on all sides of them and consequently they cohere more strongly to those directly associated with them on the surface. This attraction between molecules forms a surface "film" which makes it more difficult to move an object through the surface than to move it when it is completely submerged. Surface tension is responsible for the shape of liquid droplets. Although easily deformed, droplets of water tend to be pulled into a spherical shape by the cohesive forces of the surface layer, and absent other forces (including gravity), drops of virtually all liquids would be perfectly spherical. The spherical shape minimizes the necessary "wall tension" of the surface layer according to Laplace's law. Another way to view it is that a molecule in contact with a neighbor is in a lower state of energy than if it was not in contact with a neighbor. The interior molecules all have as many neighbors as they can possibly have. But the boundary molecules have fewer neighbors than interior molecules and are therefore in a higher state of energy. For the liquid to minimize its energy state, it must minimize its number of boundary molecules and must therefore minimize its surface area. As a result of surface area minimization, a surface will assume the smoothest shape it can (mathematical proof that "smooth" shapes minimize surface area relies on use of the Euler–Lagrange equation). Since any curvature in the surface shape results in greater area, a higher energy will also result. Consequently the surface will push back against any curvature in much the same way as a ball pushed uphill will push back to minimize its gravitational potential energy.